One of the things I’ve been working on is adding texture and pattern to each space around the house. In the past, I liked to keep everything nice and shiny and new looking, but it tended to get a bit boring to look at. I knew I definitely wanted to add some interest to the patio once we were able to use it again after the pool was complete. 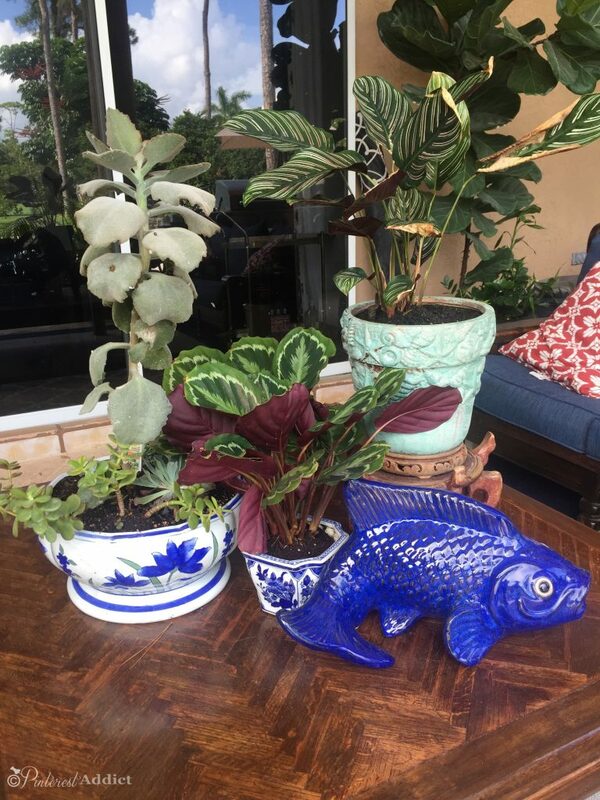 When we moved in this house last year, the previous owner left us all kinds of things… mostly junk and trash, but a few usable things like the bevy of flower pots we found stashed around the yard. I think there had to be at least 50 of them in various places, collecting moss and mosquitos. I threw out the ones that were broken and put the others aside for use at a later date. Well, now that we are finished with the pool construction, it is an excellent time to put some of them to good use. After looking at tons of ideas, I saw this paint used on a very cool project on Pinterest, here (you must check it out, it’s stunning!) 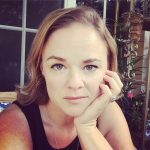 I contacted Modern Masters about partnering with them on this project. They sent me the materials to try this out. All opinions are mine, as usual. 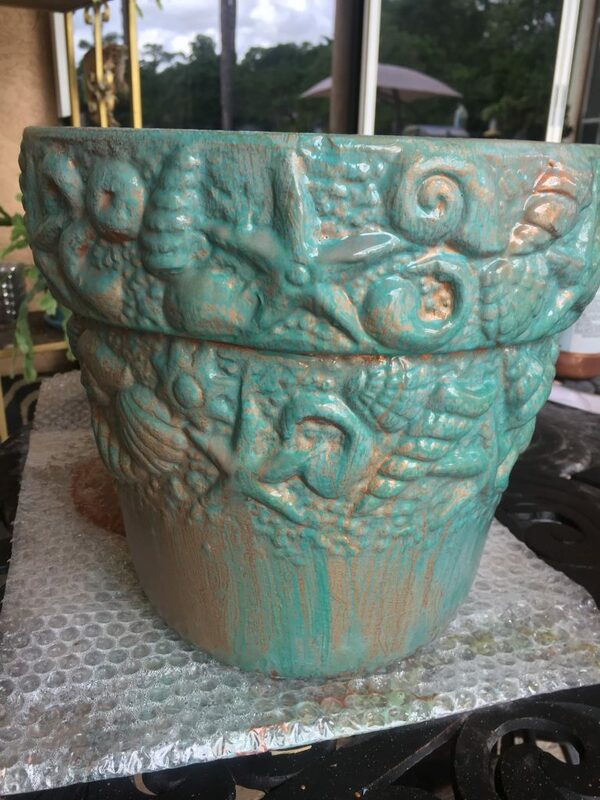 There are six of these pretty pots with a very coastal/water vibe, so I cleaned up two of them to try the Modern Masters Metal Effects Copper Patina. I scrubbed them down, making sure to bleach the areas where the moss and muck got into the crevices. 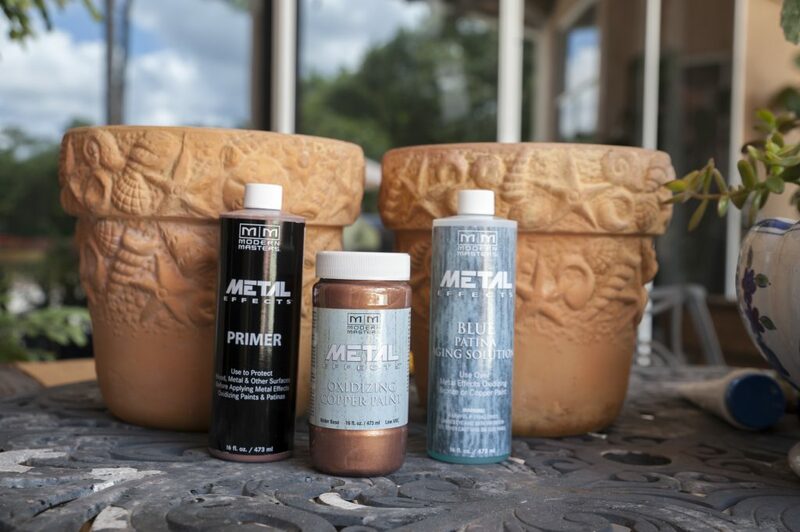 In order to achieve the patinaed copper look, the process consists of three steps: primer, oxidizing copper paint, and the blue patina aging solution. First step was the primer. I gave both pots two coats of the primer, and allowed them to dry overnight. Just putting on the primer on made the pots look better already. 🙂 By the way, clean up was super easy – soap and water. The next morning, we were set to start the next step in the process… the copper paint. 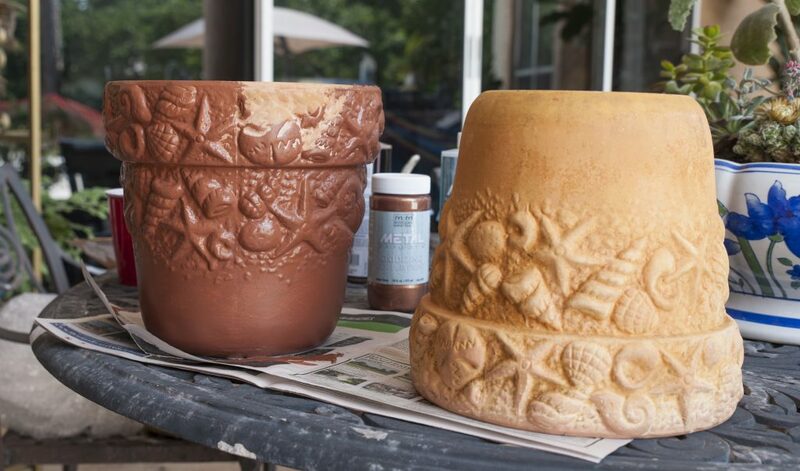 On the left, the pot has been painted with one coat of oxidizing copper paint, on the right, still just primer. 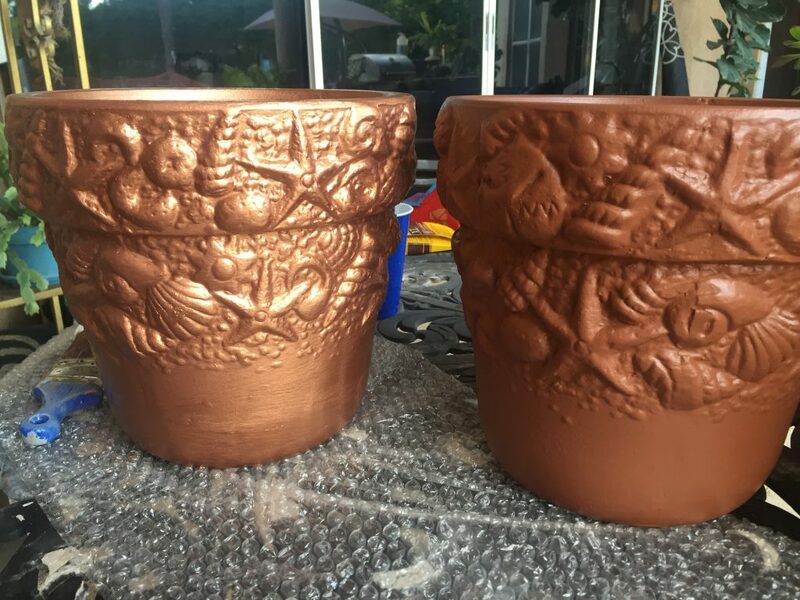 After painting both pots with the copper paint, I let them dry for a couple of hours while I did a few things around the house. Then I came back and gave them another coat of paint, then immediately (while the paint was still wet) sprayed them down with the blue patina aging solution. The picture below was taken while it was still wet, so not all the color change had happened yet. Within a few minutes, the copper started to age right before my eyes, becoming this beautiful greenish blue color. 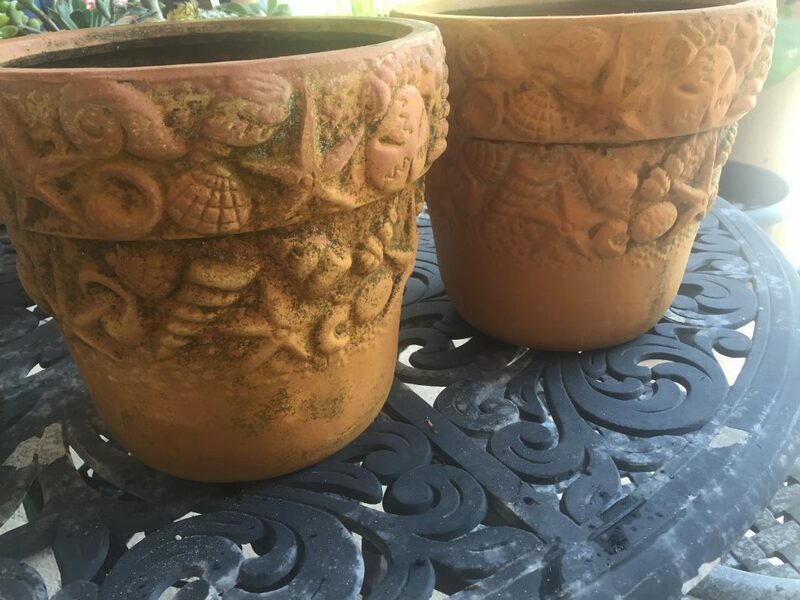 I left them to dry completely and within a few hours, they were completely transformed from your basic clay pot to some rather stunning copper patinaed planters. Pay no mind to the plants I am trying to nurse back to life. I had put them outside in the sun, and they didn’t fare so well. Oops. In the few weeks since I originally did the project, they have perked up, and are looking decidedly less crispy. 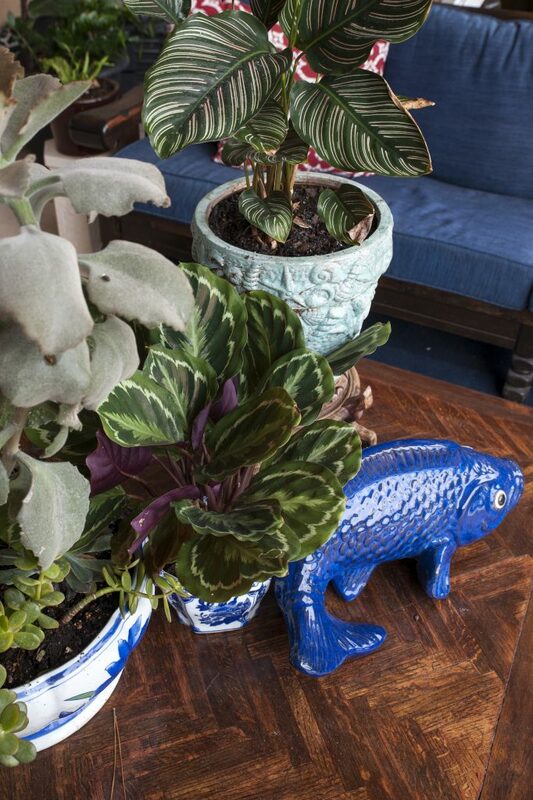 I love how it adds a little bit of interest and texture to this group of shiny pottery on the patio. The only thing I’d do differently is to paint the second coat of copper paint on horizontally, instead of vertically, giving the aging spray places to pool. You can see at the bottom of the pot, that in a few spaces, it didn’t “catch” anywhere. If you are thinking of trying out the copper patina effect, this is a great post to check out. 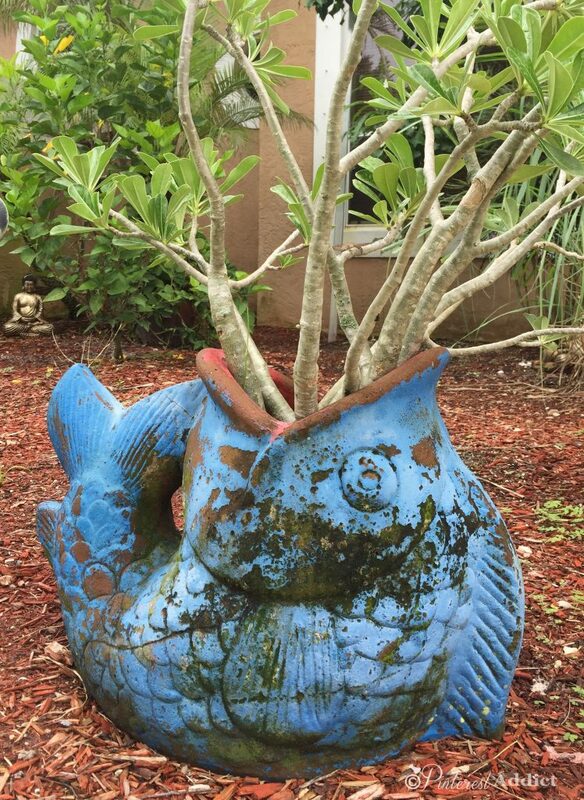 I am thinking of giving the big fish planter we have by the front door the same treatment. He could use a little bit of love, don’t you think?